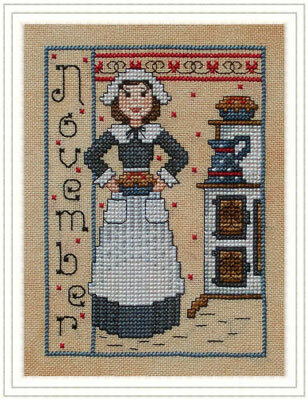 Miss November is Carol 'Cookie' Cutter. Carol is the pastry chef at the prestigious Ice Spire Inn located in the historic district of downtown Christmas Village. Her specialties are Plum Pudding, Eggnog Cake and Candy Cane fudge. Carol bakes and serves the pumpkin, apple and cherry pies for the authentic Thanksgiving feast at the Elder Elf Village every year. Carol's hobbies include collecting antique cookie cutters and unique iron cookware, cross stitching ornaments and Christmas carol karaoke . She teaches the class 'baking cookies and cakes for beginners' at the Igloo Community Center and is one of the dessert judges at the Autumn Festival. She also enjoys taste testing jams and jellies from all over the world. Carol's perfect date is a day spent browsing flea markets and yard sales followed by a simple home cooked meal, good wine and agreeable conversation. 28ct. 'Relic' lugana (stitched 2 over 2) from Picture This Plus.